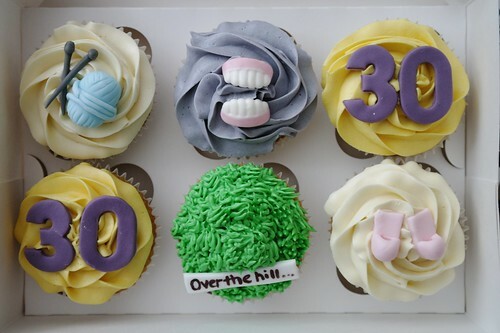 These birthday cupcakes are cute, but 30 is young! Cupcakes made by There For The Baking. I tried these for a friend who just turned 40. I couldn't find the mini teeth in my usual haunts, so I opted for spectacles instead to keep up with the cheeky humour of turning 40! What colour dye did you use to get the icing the grey/indigo shade? Loved the marshmallow-into-slipper idea- genius!